Red-bellied Parrots, also known as Red-bellied Conures or Abessinian Parrots (Poicephalus rufiventris) are endemic to East Africa, specifically Central Ethiopia, south to Pangani district north-eastern Tanzania. They are endangered in their natural habitat (CITES II); however, they are gaining in popularity in the pet trade. The Red Bellied Parrot is similar in shape and a slightly larger bird than the Senegal Parrot, averaging 22 cm (8.5 - 8.8 ins) on length. They usually reach maturity at 12 months of age, when they will be about 8 to 10 inches in length. They have wide eye rings and red irises, black bills and dark gray feet. Their wings, heads and backs are greyish-brown. The lower back has a blue tinge, although it is predominantly yellow-green. The breasts, under-wing coverts, and cheeks are washed with orange. The under-wing coverts and thighs are aqua green. Female as male, except under wing-coverts grey; breast and abdomen green. Two variations possible in immatures. Either both sexes resemble young male with much duller orange colouring and feathers with pale green edging, forehead with marked orange tinging, iris dark and adult plumage attained at 12 months or the female has green abdomen immediately. The immatures are duller and have shorter tails. The adult male has a red-orange belly, while the hen has a green one. 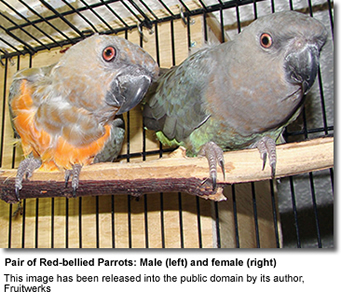 Young birds of both sexes have an orange coloration over their bellies. Captive bred and hand-raised Red-bellied Parrots generally have inquisitive, sweet and confiding personalities and are easily tamed. They are said to be quieter than most parrots; producing a variety of noises and sounds, both learned and instinctive. They are not known to be the best talkers, and not all will learn to talk, but if the owner is willing to spend time training them, many can learn a reasonable vocabulary. Prices: usually between $200 to $500, depending on source, availability and location. The Red-bellied Parrot will generally not breed until they are about 3 to 4 years old. In order to get the best breeding results, it is best to house them in a quiet, protected aviary, providing them with a 10 X 10 X 14 inch (25 x 25 X 35cm) nesting box , with a 3-inch entrance hole. The hen usually lays 4 to 6 eggs, with a two-day interval between eggs. Incubation is carried out by the hen and lasts for about 27 to 28 days. Once the chicks fledge after about 45 to 50 days, the male continues to take care of them. The chicks are usually independent at about 12 to 14 weeks. Scientific: Poicephalus rufiventris rufiventris ... English: Red-bellied Parrot, Red-breasted Parrot, Abessinian Parrot ... Dutch: Roodbuikpapegaai, Roodborst-, Somali Papegaai ... German: Rotbauchpapagei ... French: Perroquet à poitrine rouge.